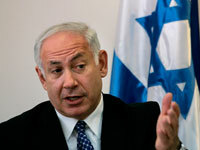 Israeli Prime Minister Benjamin Netanyahu said Tuesday his country is not planning a war with Iran and that Tehran's concerns over such a conflict are the result of the threat of additional international sanctions. Iranian President Mahmoud Ahmadinejad said Tuesday he believes Israel or its allies are considering a military strike against his country, which has thus far failed to prove that its nuclear program is peaceful. "We are not planning any wars," Netanyahu said, speaking in Moscow after meetings urging Russian officials to approve tougher sanctions against Iran. In Tehran, Ahmadinejad said Israel is "seeking to start a war next spring or summer, although their decision is not final yet," without saying where he got that information, The Associated Press reports. According to RIA Novosti, Netanyahu concluded on Tuesday his visit to Moscow with the goal of persuading Russia to support the introduction of tough additional international sanctions against the Islamic Republic. The West suspects Iran of pursuing a secret nuclear weapons program, but the Islamic Republic insists it needs nuclear power solely for civilian purposes. Iran's recent move to begin enriching uranium to 20% drew stinging criticism from the West. U.S. President Barack Obama said last week Washington and its allies would begin drafting "significant" new sanctions against Tehran. Russia, a veto-wielding member of the U.N. Security Council, has a decisive say in the issue. During his two-hour meeting with Netanyahu, Putin stressed that Russia would refrain from selling any arms to Syria and Iran that would tilt the strategic balance in the region. Netanyahu and Putin devoted most of their discussions on Russian plans to sell S-300 surface-to-air missiles, as well as the sale of Russian arms to Syria. The prime minister said he told Putin of the need to apply strict economic sanctions against Iran, along with preventing a nuclear arms race in the Middle East, Ha'aretz reports.